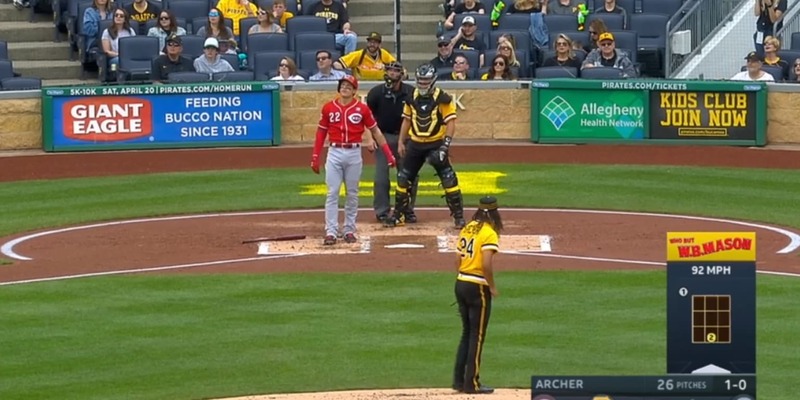 In the second inning of Sunday's Reds-Pirates game at PNC Park, Cincinnati infielder Derek Dietrich swung on a 1-0 offering from Chris Archer … and knew he got all of it. But what the ball was in the sky, its trajectory obviously destined for home run distance, just how far would it go? Dietrich was curious, so did at home plate a few seconds and admitted it as it sailed all the way over the bleachers and into the Allegheny River. See, there is bobbing up and down in the river. A truly majestic blast, clocked at 110.2 mph from the bat and a calculated distance of 436 feet. Later in the game, the machines are cleared after Archer threw a pitch behind Dietrich's next trip to the plate, so emotions were definitely running high on the afternoon.